Welcome back, NFL. The first weekend of the 2014 season is finally upon us. Summer is now officially over and hours of watching Redzone, drinking beer, and eating anti-healthy food is about to commence. 15 games take place this Sunday and Monday. To help sort out all the action, this preview includes picks for each game while highlighting a fantasy player to keep your eye on. Winner: New England. The Patriots look like the clear front-runner in the AFC East yet again. Miami has been competitive in Joe Philbin’s tenure, but with big question marks on the Dolphin offensive line and in the running game, New England has the advantage here. 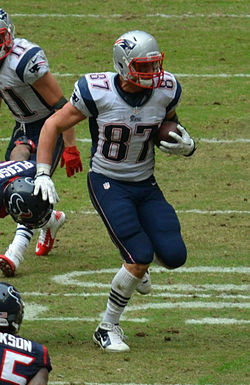 Fantasy Player to Watch: Rob Gronkowski, TE, Patriots. After tearing his ACL in Week 14 last year, it’ll be interesting to see if Gronk appears to be back to producing the way we’ve become accustomed to. Winner: Pittsburgh. The Steelers were 8-4 after their week 5 bye week last season, and should field a solid team again this season. The Browns look primed for another fourth-place AFC North finish. Fantasy Player to Watch: Le’Veon Bell, RB, Steelers. Bell enters his second season and seemed primed to break out into a top fantasy running back in 2014. However the Steelers signed LeGarrette Blount to share backfield duties, and the pair were recently charged with marijuana possession. Bell’s number of carries will be a fantasy storyline to follow in this game. Winner: New Orleans. The Saints are the NFC South favorites this season, and despite possessing talent on both sides of the ball, the Falcons will have to prove that last year’s 4-12 debacle was an anomaly. Fantasy Player to Watch: Julio Jones, WR, Falcons. Jones was leading the NFL in receiving yards last season when he was lost for the year with a foot injury in Week 5. He’ll look to prove he’s healthy and pick up where he left off against a mediocre Saints defense. Winner: Kansas City. The Titans could potentially end up with the first overall pick this offseason, and the Chiefs will come out hungry at home after a playoff collapse to the Colts last season. Fantasy Player to Watch: Jamaal Charles, RB, Chiefs. Charles finished as the number one fantasy running back last season and was the top pick in many drafts this year. Against a suspect Tennessee team, Charles should put together a solid point total. Winner: Baltimore. A huge matchup for early supremacy in the AFC North, the Ravens have beaten the Bengals four consecutive years at home and will make it five on Sunday. Fantasy Player to Watch: A.J. Green, WR, Bengals. Green will be the most talented player on the field in this game, and should show why he is consistently a top pick in fantasy. Winner: New York. If Jets QB Geno Smith can protect the football, the Jets could get out to an early lead and force Raiders rookie QB Derek Carr into mistakes. Fantasy Player to Watch: Chris Johnson, RB, Jets. “CJ2K” was barely “CJ1K” in 2013, leading to his unceremonious exit from Tennessee. He’ll look to prove he still has the talent that made him a first-round fantasy pick in years past, but it’ll also be curious to see the distribution of Jets carries between Johnson and Chris Ivory. Winner: Minnesota. The Rams’ season has been ruined before it even started since Sam Bradford tore his ACL again on August 23. The Vikings should get solid enough play from veteran Matt Cassel to get the road win. Fantasy Player to Watch: Cordarelle Patterson, WR, Vikings. Everyone knows Adrian Peterson is the fantasy star on the Vikings, but Patterson appears to be a true number one receiver for Minnesota. Entering his second year, the speedster should see himself become more of a focal point in the offense, leading to a big statistical season. Winner: Philadelphia. The Eagles are the NFC East favorite and begin their 2014 campaign with an easy home win against the constantly rebuilding Jaguars. Fantasy Player to Watch: Toby Gerhart, RB, Jaguars. Gerhart enters his first season as a feature back in the NFL after spending his first four as a backup with the Vikings. He’s projecting to receive over 20 carries a game for Jacksonville, and fantasy owners who drafted him on potential would like to see it come to fruition. Winner: Chicago. The Bears are a legitimate threat to challenge in the NFC this season and should be able to hold off a young Bills squad at home. Fantasy Player to Watch: Matt Forte, RB, Bears. Forte is often the forgotten man in Chicago. The Bears receive headlines for their passing attack highlighted by Jay Cutler, Brandon Marshall, and Alshon Jeffrey, but Forte is the catalyst for this offense, and should continue to put up consistent numbers. Winner: Washington. The worst two teams from last season square off, but both were division champions in 2012, and still contain talent on both sides of the ball. Whichever team is able to make a big play should come out victorious, and Washington has more threats to break the long one. Fantasy Player to Watch: Arian Foster, RB, Texans. After three consecutive seasons with over 1,200 rushing yards, Foster gained only 542 in eight games last season. Fully healthy and looking to rebound, 2014 could be a big season for the Texans running back. Winner: Tampa Bay. The Panthers won the NFC South in 2013 and the Bucs finished last, but their offseasons may have changed their fortunes. Tampa Bay acquired impressive talent via the draft and free agency, while Carolina lost important pieces. The Buccaneers make a big statement and win at home to open 2014. Fantasy Player to Watch: Cam Newton, QB, Panthers. Newton has been a fantasy star in his first three seasons in the NFL. However he lost his top two receivers in the offseason and underwent ankle surgery. Seeing him move fluidly in and out of the pocket will go a long way toward restoring confidence in his owners. Winner: San Francisco. Despite all the talent the Cowboys have on offense, their defense will be the worst in the league this season. A matchup with the well-rounded 49ers’ attack will not make Dallas owner Jerry Jones very happy in Week 1. Fantasy Player to Watch: Tony Romo, QB, Cowboys. Romo had back surgery in December, making it unknown how effective he’ll be this season. A healthy Romo is also a welcome sight for Dez Bryant and Jason Witten owners. Winner: Denver. In a possible AFC playoff preview, Peyton Manning faces his former team for the second time, with this matchup ending better for him than last season. Fantasy Player to Watch: Emmanuel Sanders, WR, Broncos. After Eric Decker left for the Jets in free agency, the Broncos wasted little time replacing him with Sanders, the former Steeler. Now that Wes Welker is facing a four game suspension, Sanders will have an even bigger role in the most dangerous offense in football. Winner: Detroit. The Lions have a much better offense than defense, but they’re playing Eli Manning, who led the league in interceptions in 2013. Detroit should be able to get a turnover or two, guiding them to a win in the first game Monday night. Fantasy Player to Watch: Reggie Bush / Joique Bell, RB, Lions. Bush is listed as the starter, but both Lions running backs were given enough touches last season to make them each valuable. This season it’ll be worth noting if the scales tip in either direction. Winner: Arizona. Both teams impressed last season and exceeded expectations. Unfortunately they play in the AFC and NFC West, the two most competitive divisions in football. This should be a great finale to Week 1, and the Cardinals pull out the victory at home. Fantasy Player to Watch: Andre Ellington, RB, Cardinals. Ellington emerged in his rookie season last year as a Jamaal Charles-style runner who is able to handle the load of the running game while factoring into the passing attack. If Ellington is used early and often, he could truly break out.